there is bound to be something for everyone. There are only a few things as satisfying as sinking your teeth into luxurious Mithai and experiencing utter bliss. Soft and syrupy Gulab Jamun to tickle your taste buds. Rich and indulgent Mango Kalakand that melts in your mouth, creating a flavour sensation like no other. Colourful and extravagant Anarkali, as easy on the eyes as it is on the palate. Barfis, Katlis, Laddoos, Pedas, the choices are endless. Your only task is to make your way to a Kamat Shireen near you, and find ultimate satiation. A gentle mix of the freshest, ripest fruit, rich cream and an assortment of dry fruit and nuts, all churned together to create something truly magical. With the right amount of sweetness, perfectly smooth ice cream and chunks of fruit & nut evenly distributed through every scoop for a bit of texture, and the most glorious flavour that pleasantly lingers, only to leave you longing for more. Kamat Shireen Ice Cream, supreme gratification in its truest sense. The key to a happy and successful life, is finding balance. With the perfect mix of savoury, spicy, tangy and sweet, to create an array of delectable Namkeen – you are that much closer to finding happiness, the moment you walk through our doors. Delightful concoctions like Navratan Mixture and Khatta Meetha are bound to awaken your senses, and a sensational miscellany of Chivdas and Snacks will make your heart sing with pure joy. Created with copious amounts of love and care, Kamat Shireen promises to be the best way to a persons heart. Authentic Indian Mithai, an assortment of Namkeen and a selection of all-natural Ice Cream, prepared using only the finest ingredients to guarantee superlative quality. With an impressive melange of extraordinary delicacies to choose from, there is bound to be something for everyone. Nothing beats the gratification of sinking your teeth into decadent Indian mithai. At Kamat Shireen, we understand the importance of a satisfyingly indulgent dessert experience, so we serve nothing but the finest sweets. 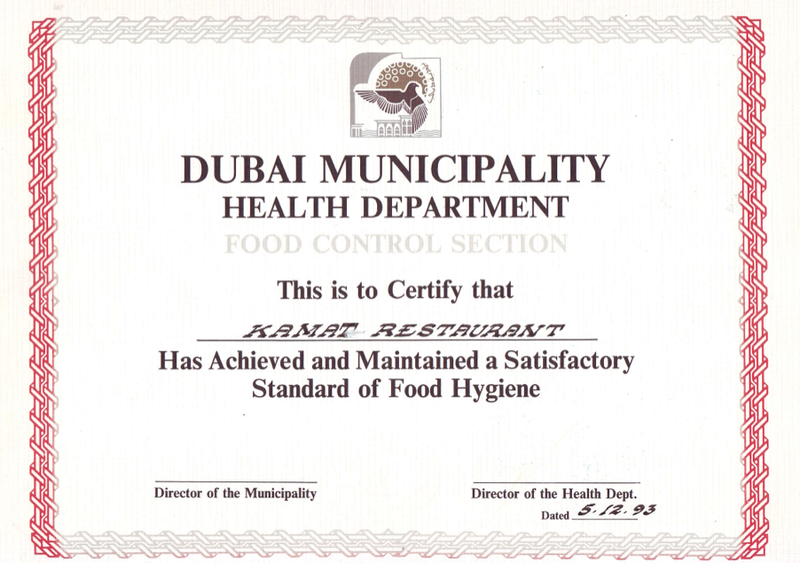 We strongly believe in quality assurance and have implemented stringent quality control standards throughout our kitchens. Every delicious delight on our menu is created with the most impeccable ingredients which are carefully sourced, in order to guarantee top-notch quality and consistency. Made with copious amounts of love and immense attention to detail, our sweet delights are happiness in every bite. With ISO 9001 and HACCP certifications, rest assured that you will have a quality experience from the first mouthful to the last morsel. There is no better way to thoroughly impress someone, than to gift them happiness. No matter what the occasion, impeccable sweet treats, elegantly packaged in prepossessing boxes will never go out of style. Using the finest ingredients, from all parts of the world, gifting someone a box of Kamat Shireen, is truly an extraordinary offering. So, share the love and start a sweet tradition. Near Sharaf DG, Alongside Kamat & Gazebo Restaurant, Bur Dubai.